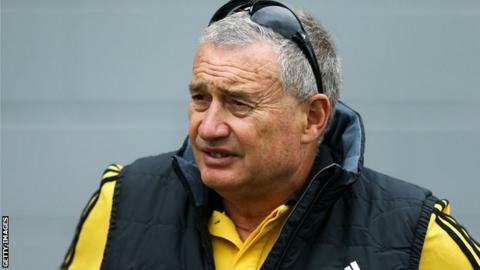 Northampton Saints have appointed New Zealander Chris Boyd as their new director of rugby on a three-year contract, starting in August. The 59-year-old has been head coach of Kiwi side Hurricanes since 2014 and led them to the Super Rugby title in 2016. He previously took charge of Wellington and New Zealand Under-20s. Boyd will take over from interim boss Alan Gaffney, who has been in charge of Saints since Jim Mallinder was sacked in December after 10 years at the helm. "Northampton Saints is a club I have admired all of my coaching career," he told the club website. "I visited Franklin's Gardens for a week in 2004 when Wayne Smith was head coach, and remember the passion of the Saints supporters and the strong culture at the club. "The club's ambitions match my own - I am confident I can help the Saints become one of the biggest and best teams in Europe." Boyd will remain with Hurricanes until the end of the Super Rugby season before joining in time for the start of the 2018-19 Premiership campaign. Saints, 10th in the table, will be the first team outside New Zealand of which Boyd has been in charge of on-field affairs. He worked with Tonga during the 2011 World Cup, when they defeated France, while he has coached World Cup winners such as Ma'a Nonu, Beauden Barrett and Julian Savea during his time at Hurricanes. Saints chairman John White added: "Chris has an impressive record as a coach and getting him over to Northampton is a massive statement for the club, and confirmation of our determination to compete at the highest level." This is an appointment that should excite the Saints supporters. Boyd overhauled the Hurricanes when he arrived there in 2015, transforming them from underachievers to Super Rugby champions. He now has to do the same at Saints, who are in need of change on and off the pitch. He is hugely experienced, highly respected and also much sought after in the rugby world. The fact he wants to come to Saints says a lot about the ambition of the club to re-establish themselves as a force in English rugby.